This recipe is legendary in my household, or at least I've decided it is. When I recently got married, my husband insisted that he hated stir fry. I made this one night to see if I could change his mind, and he absolutely loved it. Many people insist on shortcutting with frozen stir fry vegetables, but I love the crunch of fresh vegetables. You can also change up the recipe to suit your tastes, adding mushrooms, water chestnuts, baby corn, but this is a good starting place. Slice chicken into small pieces or strips and place in a large resealable bag. Add cornstarch and shake well to coat all pieces. Combine all stir-fry sauce ingredients in a small bowl and stir well. Pour half of sauce into bag with chicken. Refrigerate for 30-60 minutes. Heat 2 tablespoons of cooking oil in a wok, add chicken and stir fry (which means, toss and stir your food as you cook it so it cooks evenly with equal flavor and texture). Once chicken cooked completely (no longer pink, cooking times will vary depending on the size of your chicken pieces), remove from skillet and set aside. Add 1 tablespoon of cooking oil into the wok and allow it to heat up. Add and cook vegetables & garlic, tossing and stirring frequently until they are slightly tender but still crisp. Add 1 tablespoon cornstarch to remain stir fry sauce and stir to combine thoroughly. Add sauce to vegetables and return chicken to wok. Cook and stir for an additional several minutes until sauce is heated and coating all ingredients. Enjoy over a scoop of white rice or brown rice. 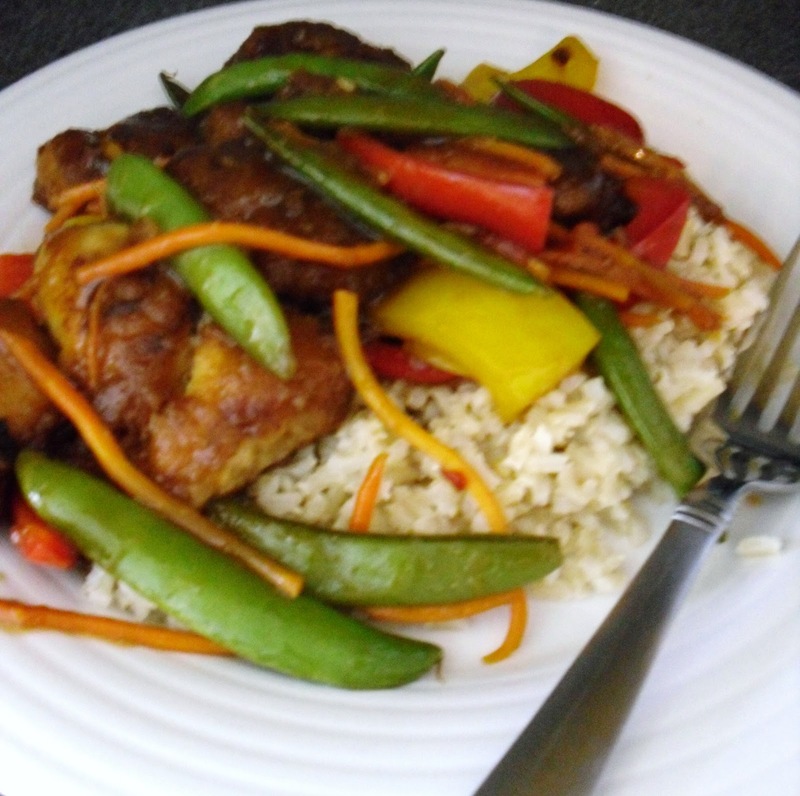 Variation: You can also replace the stir fry sauce in this recipe for my sweet and sour sauce recipe, posted previously in this blog. The sweet and sour sauce recipe should be doubled.